If we know anything about college basketball, it’s that we really know nothing at all. This is the hazard of believing anything but that. But anytime you can write a couple thousand words on a team that loses during the opening weekend of the NCAA Men’s Basketball Tournament, you gotta do it, right? The Wichita State Shockers, were that team and I was that author, and they were upset 78-76 in the third round by the Kentucky Wildcats after a fantastic forty minutes of basketball. It might be easy to categorize the Shockers loss to the Wildcats in some grander sense, or contextualize it so that it laments disproportion in society. That is: hard work might not always overcome the adversity of being the little guy; that, in a sense, the guys born with the advantages -- in this case, genetics and institutional knowledge and tradition and such -- will simply always prevail, or at least prevail more times than not. It would be unfair, though, to suggest a disparity in the definition of student-athlete at each university, despite a higher turnover rate at one institution than the other. After all, these are just kids. The choice between millions of dollars and fulfilling a dream and living on a college campus is one most of us will never have to make. One-and-dones, collegiate contradictions, and millionaire coaches are the reality. Disagreement and fighting is futile. 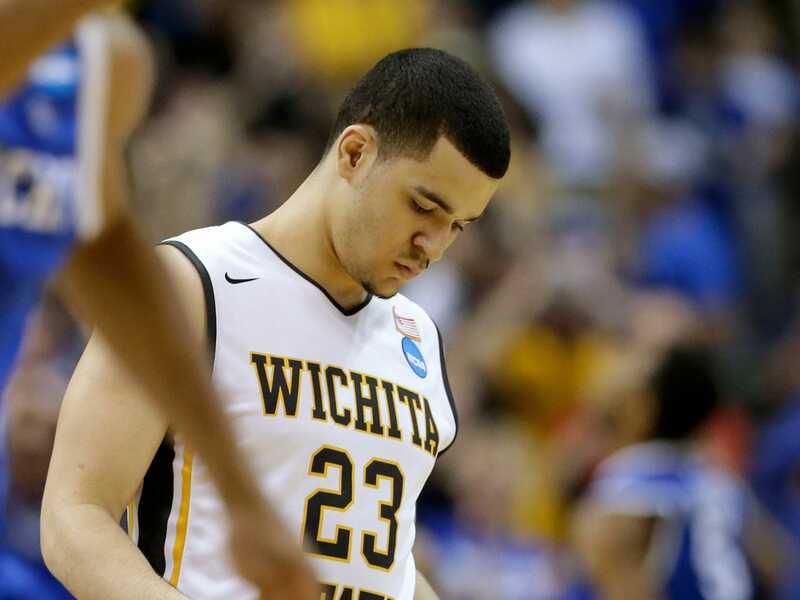 The Shockers bowed to that reality, in a sense. But it is probably more accurate to write that they lost their basketball game. There is a perversity in rooting for perfection. It’s pulling, essentially, for an abstraction. I wonder if we’d be rooting for Kentucky if the team of talented toddlers have been carrying the unblemished record and the Shocker’s seasoned stable were looking to snap their streak. Probably not. We tend to pull for those who seem so gifted and blessed and, in that regard, so unlike us to come down to a level more like ours. Wichita State, though, was already so easy to see as projections of some ideal ideal selves: undersized, overachieving through an Indian summer of athletic success, but with some recognizable human limitations. We teach the people within our charge -- our children, our students, athletes we coach -- about the lessons inherent in both wins and losses. The point we try to make is that what we glean from triumph might only be outweighed by what it feels like to hit the floor. In the end, Wichita State’s exit from the NCAA Tournament will be only slightly more memorable for most of us than the exits of the other 67 teams. We’ll forget them as we turn on our TVs to watch those wildly talented teenagers so vastly different from us as they play this weekend, and the next, and for as long as they can, and as far as we can see into the future. There may always be more success for the Kentucky-s than the Wichita States on our basketball courts and off. While we may ultimately be united in our lack of knowledge about basketball and life, and share the same giddy impulses to believe we know different, we’re also reminded by teams like the Shockers that we can all achieve on a plane a little higher than we normally do. That does not necessarily mean winning everything, but it means something. It always has and it always will. If you are searching for some exceptional ac service, you need to know the air conditioner service 92688! They will be available at your first call, no delays and pretty amazingly satisfying services! We really discover your site with regard to performing checks in addition We really now arrived at really feel therefore asked go to kccatl website. We really seemed to be obtainable an activity to attempt your own for the unique creating business in addition Picture avoiding all of them. Perhaps now, with the way of thinking you really talented individuals, I will give it a try. The appearance positively wonderful Draftkings promo code. All of these miniature info are fashioned utilizing massive amount historical past experience. I want it all significantly. V těchto dnech, najít dobré Stavba domu a pěkný byt je obtížné. Ačkoliv se zdá, že jsem našel zdroj zde, který by umožnil, že pro mě a pomohl mi dostat se tam.